There has been an English community in Utrecht since the late 15th century when soldiers were garrisoned in the city. The first record of a military chaplain dates from 1618 when a Scotsman, probably an Episcopalian, was appointed. In 1622, the congregation, no longer dependent on the military, had a civilian chaplain, Thomas Scot. At that time, the chaplaincy was independent of the church in England and followed the Presbyterian traditions. After two centuries, which covered the Napoleonic Wars and the establishment of the Kingdom of the Netherlands, and furthermore saw the virtual disappearance of the English community in Utrecht, the congregation was once again large enough to warrant the services of a chaplain, this time Anglican. The chaplaincy was at first served from Amsterdam and later from Rotterdam. In 1911 work on the present building was begun with the foundation stone being laid on Nov 9th 1911 by Rt Rev Bishop Bury, DD Bishop of Northern and Central Europe. The first service was held on a year later on 24th Nov 1912. In 1913 the first resident chaplain, Rev. A. Blakiston, was appointed and the church was consecrated on 2nd June 1913. 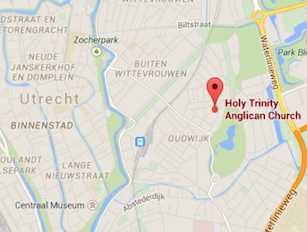 Apart from a four year period during the Second World War, there has been an Anglican chaplain in Utrecht ever since. As Utrecht was once served from other centres in the Netherlands, so it in its turn has served Hilversum, Arnhem, Enschede, Amersfoort, Groningen and, more recently, Zwolle which it continues to serve.